You can literally print these things in full color for pennies! If you are willing to go knock on some doors to businesses in your area these flyers can really bring in some sales. They are also great for existing customers to promote specials or limited time offers. Say you average 75 catering orders in a month you can get this amount of flyers printed really cheaply. If you designed them 3 to a page it would only take 25 sheets of paper which you can definitely afford. Even if you made them full page flyers you can probably find printing for around $.25/sheet which would be less than $20. You can then make sure each of your catering orders gets one of these delivered. What should you promote? That is the fun part! You could put a coupon to encourage them to order again soon. Or maybe you have a limited time offer the next month you want to start pushing. For example, in November and December we sell a bunch of Holiday Meal Packs so we start pushing those at the end of October. Flyers should definitely be part of your marketing mix! 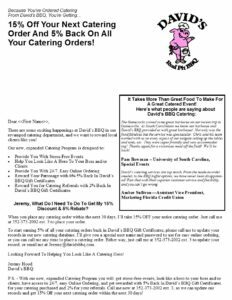 Designing a flyer for your catering services is not difficult, just follow these simple yet effective ideas. At the very top of your catering flyer you want to add a photo of your product that you are trying to promote. If you are not necessarily promoting a specific product (coupon or discount) you should still put a photo on top. People are visual, a nice looking of your food will get their attention. You don’t even need to hire a professional. Any current smartphone can take photos that are good enough for your flyer! Plus you can play with the filters to really make it stand out. If you want to take it one step further, invest in a DLSR camera. It will cost you a couple hundred bucks but the pictures you get out of it will pay dividends. You can use the auto feature until you learn how to use the settings but this is one of the best things we ever purchased. As you start to design more of your own marketing materials you can learn how to use editing software like Photoshop and really make your photos look nice. I even had a customer ask who our food stylist was one time! Just under the photo or on top of the photo you need to write a headline that quickly gets your point across and entices the customer to keep reading. Many people stress the headline as a make it or break it item but if your picture looks good enough you will still get responses. Your headline can simply be a title of the promotion or it can be some salesy type language to get the customer to keep reading. Be careful, however, not to use too tricky language that is misleading. This might lead your customer not to trust you in the future. Your headline should standout. Make the text size larger than the rest of the text in the description area. You can even make it bold and underline it as well if you think that makes it stand out. Use the description section to convince your customer to make a purchase! You want to make their mouth water by providing as many details as possible. What kind of ingredients do you use? What kind of cooking processes do you use? You should also list the details of your offer such as pricing, expiration dates, and any limitations. This will give those customers that are interested everything they need to make a decision. The most important part! I hate to admit it but there have been printed materials we have sent out without a CTA or contact information…not good! You need to tell your customer what their next step of action is. Call us now to order. Fill out this form and send it here. Email us today. Etc. 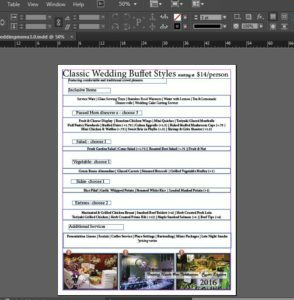 You can see many examples of catering flyers online, but the ones I am providing for you to download for free are pretty simple. One is 1/3 of a page with printing on both sides. The other is a single page with printing only on one side, almost like a letter. As you can see the first one with the holiday meals, the front has image of all kinds of holiday type foods. The back is a sales form which is our call to action. We try to make it easy for the customers to order these packs and we sell quite a few between November and December. The customer can simply fill out the form and return it to the store or they can take a picture of it and email it back to us. We are really trying to eliminate any barriers that make it difficult for them to order. The other was a promotion that we used to encourage our existing customers to sign up for a new loyalty program. We handed this flyer out as we fulfilled existing orders and as you can see the headline was the main attraction on this piece. 15% off on the next order and 5% off future orders? Um, yes, sign me up! What’s not to like about that deal. We had a pretty good sign up from this campaign. The holiday flyer was created in Adobe’s InDesign and the loyalty campaign flyer was created in Microsoft Publisher. If you don’t currently use them don’t worry, just use the links I have provided to sign up for a 30 day FREE trial, more than enough time to crank out a few flyers! 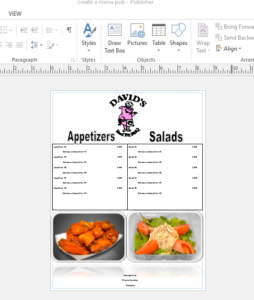 Please let me know how these catering flyer templates work out for you if you decide to use them! 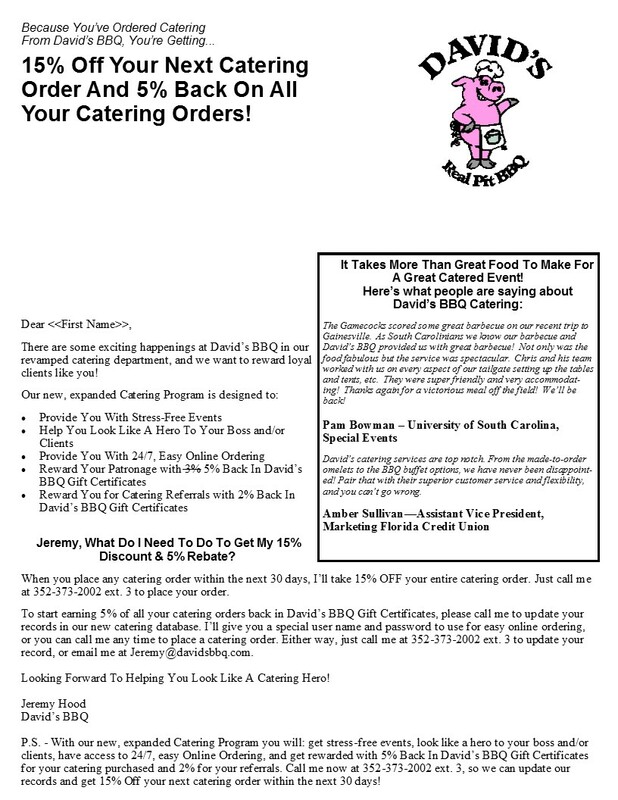 Previous Previous post: How to market your catering business for success!